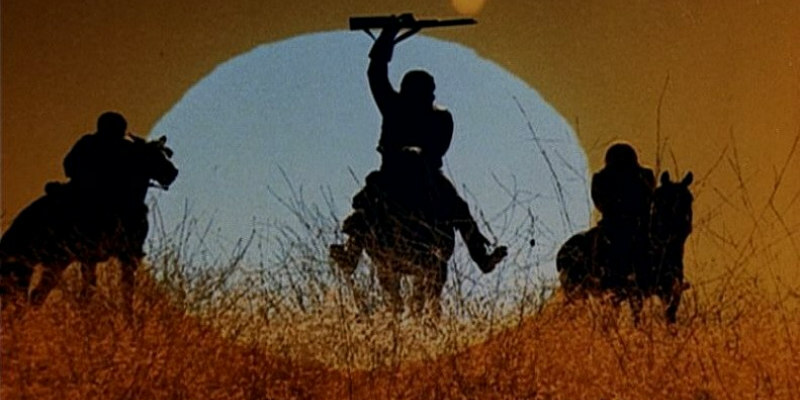 We look at the small screen spinoff of the Planet of the Apes phenomenon. Following on the heels of the wildly successful five film franchise, Planet of the Apes was an hour format television series that premiered September 13th, 1974 on CBS. The series ran for 14 episodes, with only 13 of them being aired at the time. 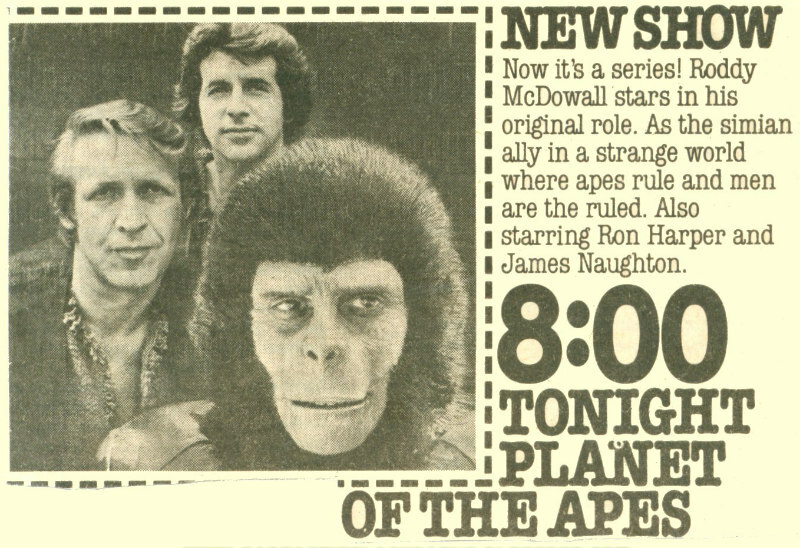 Roddy McDowall, from four of the five films, stars as the chimp Galen, with Ron Harper and James Naughton as astronauts Alan Virdon and Peter Burke. With visibility of the Planet of the Apes franchise at an all-time high, although actually quite small in comparison to the deluge that would follow Star Wars three years later, the idea of a Planet of the Apes television series was a relative no-brainer. In fact, it was considered such a guaranteed win that CBS ordered 14 episodes without first commissioning a pilot, which was an extremely uncommon practice for that period. A Star Trek related side note is that CBS was so certain of the series' success that it dropped another genre TV show they were considering at the time in the form of Gene Roddenberry's Genesis II. With all of these high hopes, it may come as a surprise that the series never made it past this initial 14 episode order. Planet of the Apes begins with the standard astronauts going through a time warp into the far future scenario that we saw in the first two films. After this, continuity with the movies is largely disregarded. Within minutes we see a boy chimp with his pet dog, all of which had supposedly been wiped out in plagues mentioned in the fourth film. Things only get worse when a bit of dialogue from Dr. Zaius mentions previous such spaceship crashes (clearly a reference to the first two films) as having occurred a few years earlier. However, this really doesn't make much sense given not only the far superior technology level of the humans that we see, but the fact that they are all capable of speech as well. Also, and again unlike the films, there are enough above ground ruins of human cities to make one question just how it is that no one knows that humanity had a complex civilisation prior to the apes. The series itself seems to have trouble reconciling this point, as even in the last episode there is a reference to an ancient book that must have been written by humans, but the point is not even addressed. Aside from this, there are equally well thought out elements. For example, it is illegal for humans to ride horses, and there are clearly played out racial divisions within the ape culture itself. Ignoring the contradictions with the film series, I found the show much more entertaining now as opposed to when I first watched it as a child. After Virdon and Burke escape from the apes with the help of Galen, the series takes on the standard Fugitive style format. The difference here is that the writers were able to cover then current racial issues under the guise of the ape/human friction of the setting. While some of it is a little dated in its presentation, it definitely reminded me a bit of the later FOX series Alien Nation from 1989. Given when it was made, Planet of the Apes is heavily episodic, which, along with the regular use of standard '70s television tropes, definitely dates the series even further, but even with all of this, a couple of episodes did have endings that I didn't see coming. As a result, I found the show much more watchable this time around, and quite entertaining at times. The acting in the series is somewhat uneven. McDowall's four films' worth of experience is clearly on display, as I felt from the outset that he frequently out-acted the other two male leads, even through all of the ape prosthetics. He also did this with the other stars who appeared as apes, with the one notable exception in General Urko who, in another side note to Star Trek fans, was played by Mark Lenard. Mr. Lenard clearly understood how to make the ape prosthetics work, so his acting is outstanding as well, but I'll have to be honest: it did take me a few episodes to get past hearing Spock's dad's voice every time he spoke. I think a contributing factor here is that Virdon and Burke were not given much to work with, character wise, in the early episodes. Ultimately, Virdon's character comes in to play more towards the end of the run, but I think both of them were fighting an uphill battle against the writing for most of the series. Like the animated Return to the Planet of the Apes, I had watched this series when it originally aired, and my viewing became sporadic fairly quickly, for reasons that are fairly obvious to me now. With the focus on the more adult oriented themes of racial issues, action very much takes a back seat in the stories. For a series that should have been targeting kids, this was a recipe for disaster, and I would have to guess that this was the single biggest contributing factor to the series' failure. As a child at the time, I would hardly be interested in using my Mego action figures of Virdon and Doctor Zaius to play out scenes reminiscent of Harper Lee's To Kill a Mockingbird. Without this younger audience, the show was all but doomed in the ratings. Regardless of this, I have to say that I came away with a much stronger respect for the show in my revisit, which is not usually the case for these trips back down memory lane. Unfortunately, the series is no longer readily available on DVD. However, if you are a Planet of the Apes fan who is willing to look past the rather plentiful continuity issues and find an opportunity to get access to the show, it is definitely worth a look.